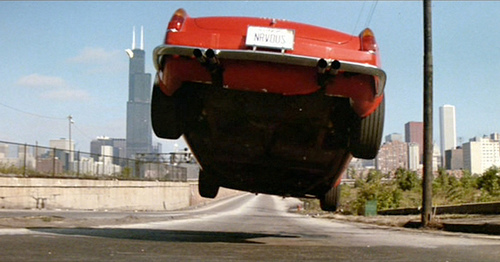 I guess in this case FBI stands for "Ferris Bueller Imitators." 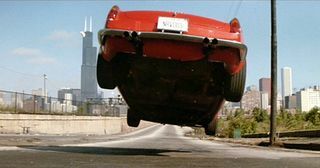 According to the Detroit News, a Michigan insurance company has sued the FBI and the Department of Justice alleging that one of its agents totaled a $750,000 Ferrari during what appears to have been a very short joyride. The car was stolen from a dealership in Pennsylvania in 2003, and the dealer submitted a claim to the insurer, which paid. The car later turned up in Kentucky, where it was put into storage while the case was being investigated. In May 2009, it was wrecked just outside the warehouse. The insurance company, which now owned the car, asked the feds to pay for the Ferrari they crashed. According to the report, the feds rejected the claim on the grounds that "the crash happened while the Ferrari was being detained by the FBI." Yeah, I think that's the point, the insurer probably said, and submitted the claim again. No payment. Nor, apparently, were the feds willing to explain how the car was wrecked. (If they actually used the words above, then as always the use of the passive voice – "the crash happened" – is a dead giveaway.) The insurer had to file a request under the Freedom of Information Act to get documents relating to the crash. The DOJ then produced documents including an email from an assistant U.S. attorney stating that he had taken a "short ride" in the car, which was being driven by an FBI agent. The agent lost control of the car within a few seconds of leaving the warehouse, and the car fishtailed and slid into a tree. If any of the documents explained why the two gentlemen had taken the car out for a spin in the first place, the report doesn't mention it. Probably all part of the investigation, I imagine. Or maybe it's a matter of national security? I almost feel sorry for the FBI agent. The Director was probably so pissed. He loved that car more than life itself. Never even drove it. Just rubbed it with a diaper.